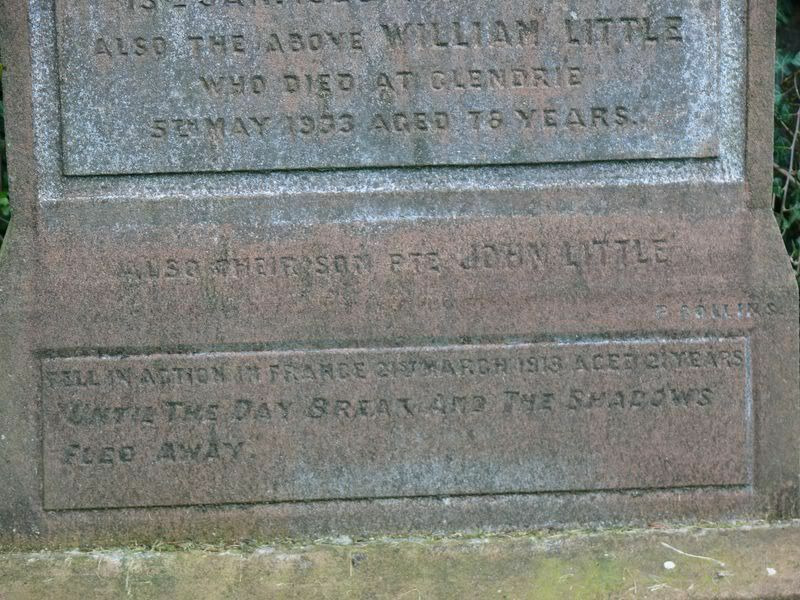 There is no clue about his service on the gravestone but this is actually a CWGC listed grave with a private stone. Grave/Memorial Reference:	Near South-West corner of Church. 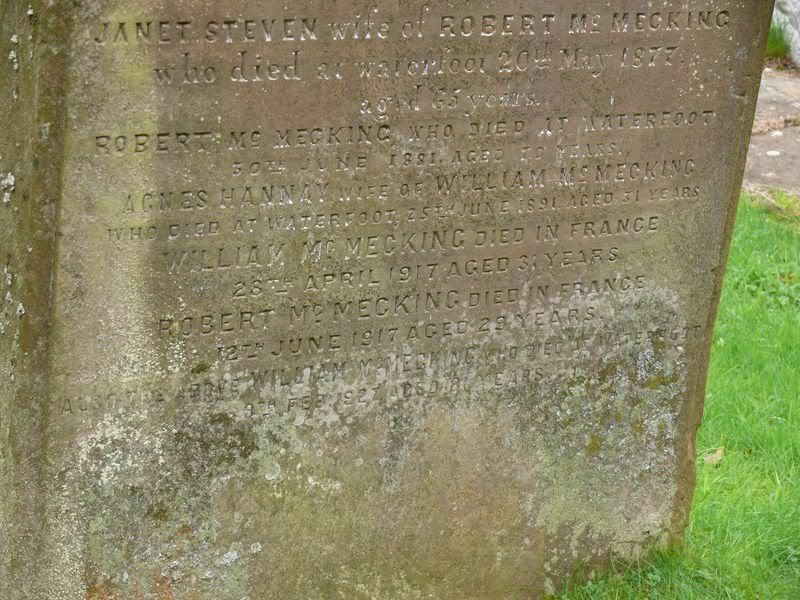 Additional information: Son of William and Agnes McMeeking, of Waterfoot, New Luce, Wigtownshire; husband of Mary Ann Matthews McMeeking, of Stairdam, Murthly, Perthshire. Unit Text: "D" Bty. 256th Bde. 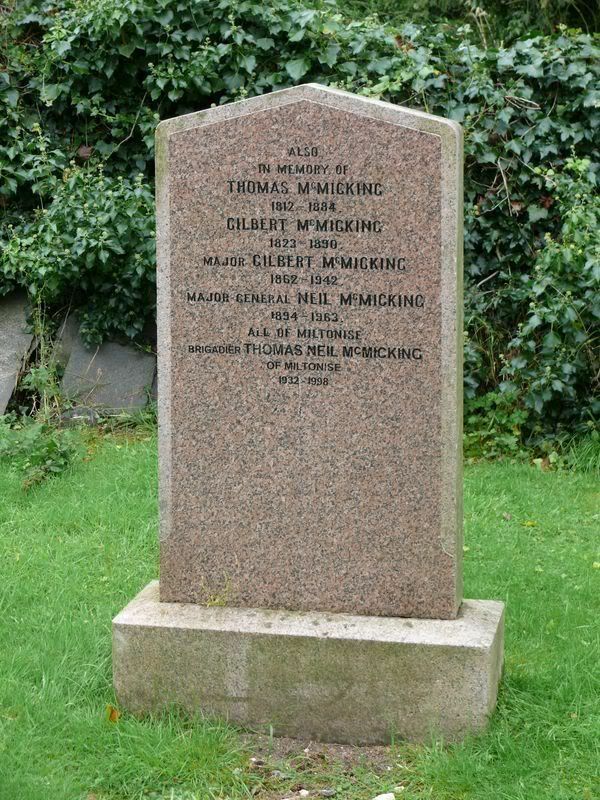 Additional information: Son of William and Agnes McMeeking, of Waterfoot, New Luce, Wigtownshire. Grave/Memorial Reference: II. C. 17. 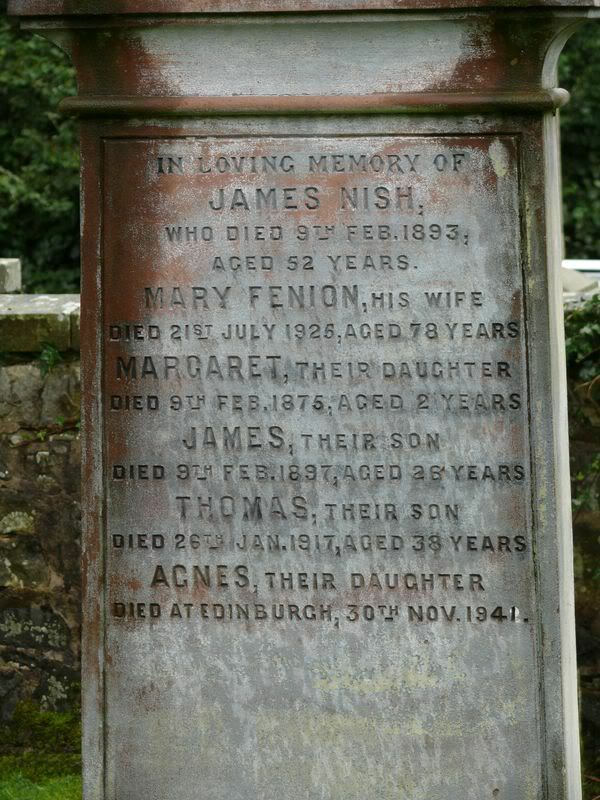 You need to read both sides of this gravestone to get the full name. 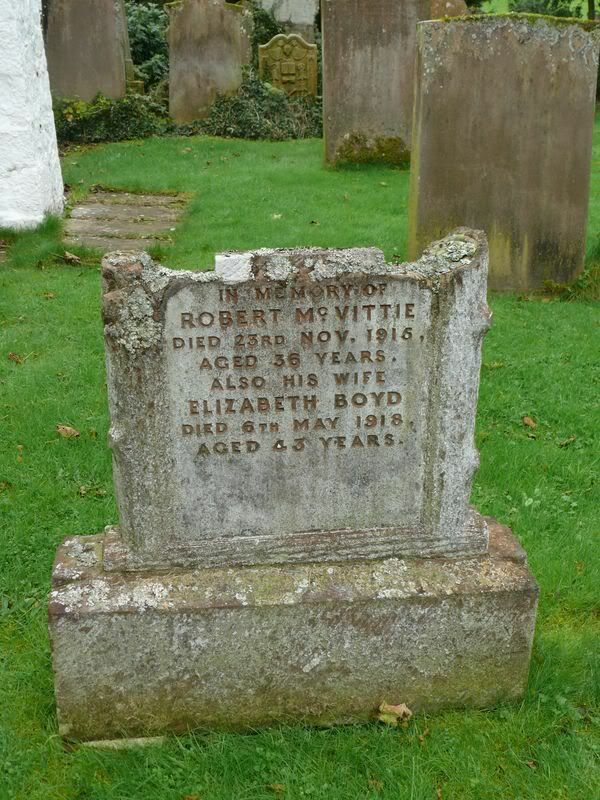 Additional information:	Son of Robert and Elizabeth McVittie; husband of F. M. McVittie, of Edgehead, Midlothian. 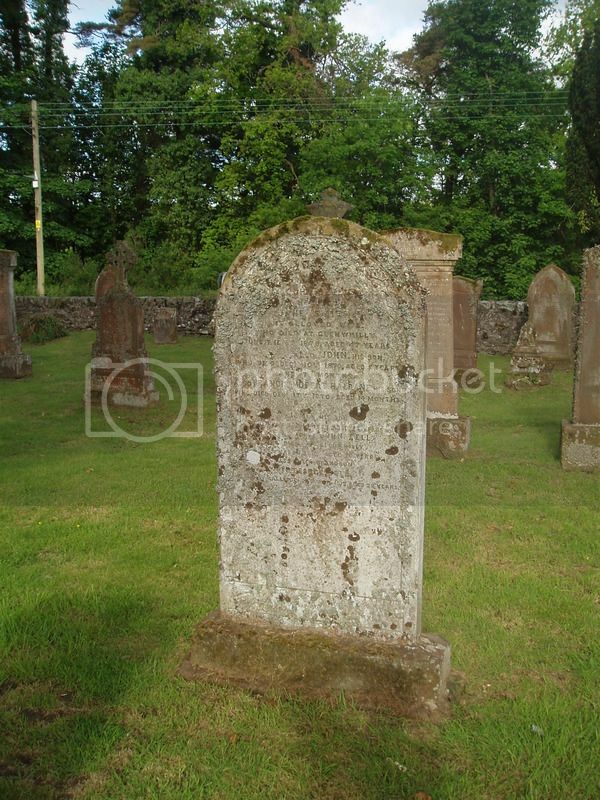 Grave/Memorial Reference: XIX. B. 8. 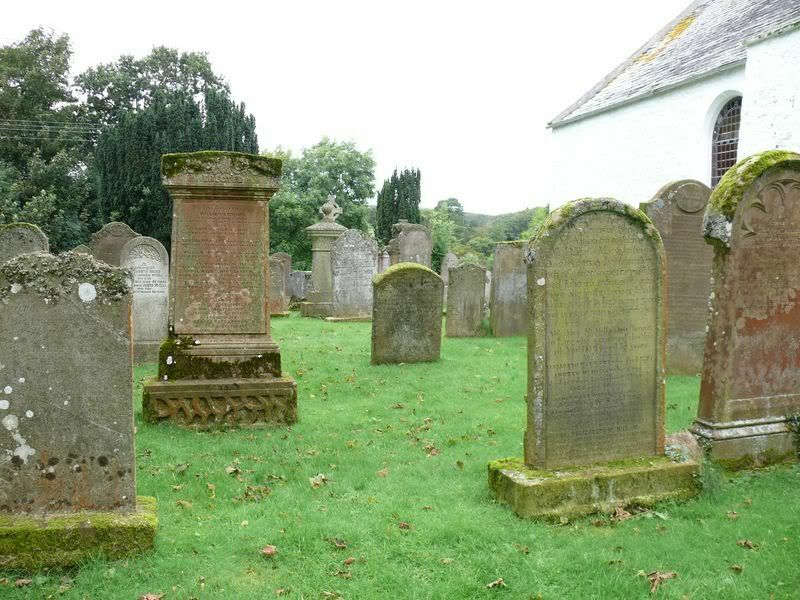 The survey by the Dumfries and Galloway Family History Society suggests there may be one more: George Bell, died 25 April 1915. I'll check it out next time I'm out that way. 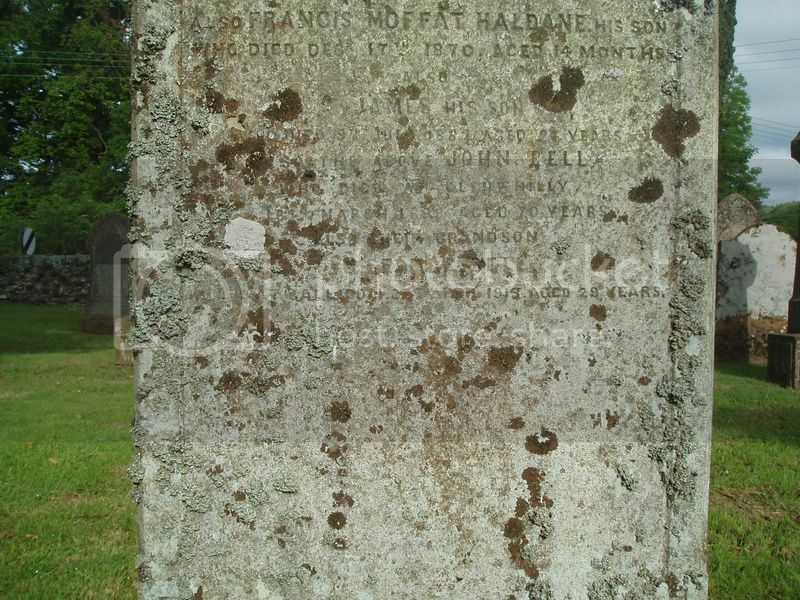 Son of Jane McFadyean Bell. Native of Scotland. I tend to agree. When I go that way I'll get a photo. 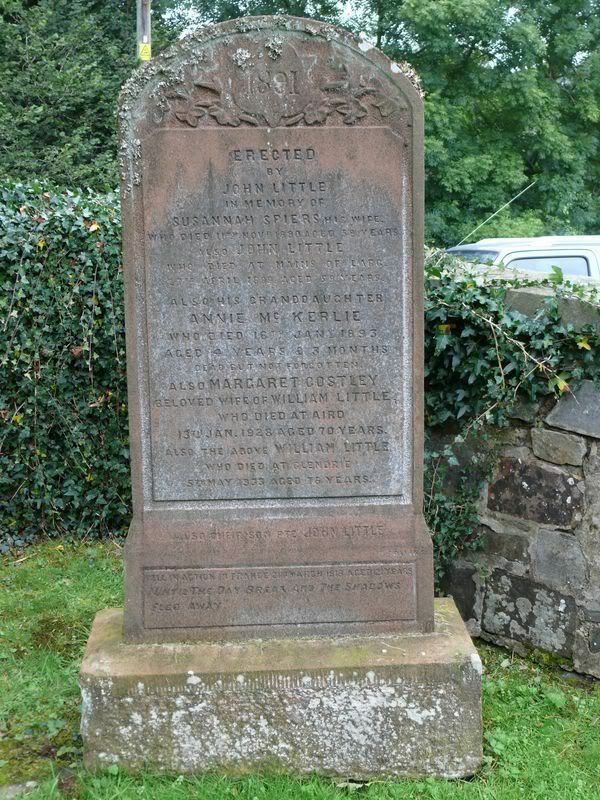 It's a bit convoluted but George Bell is named on the War Memorials at Balmaclellan and Corsock. George Lavender Bell – age 29 – Private (275) 11th Battalion, Australian Infantry. Enlisted September 1914 at Perth, Western Australia. He left from Freemantle in November 1914 for Egypt. In early March 1915 his battalion moved to the island of Lemnos and a month later received orders to prepare to make amphibious assault at Gallipoli. On 25 April the 1st Australian Division landed at ANZAC Beach. George was reported missing presumed killed that day, but in 1919 his remains were found and interred. Killed in Action – 25 April 1915. Commonwealth War Grave – Plugge's Plateau Cemetery, Anzac, Gallipoli, Turkey. He had worked with his cousins on the family farm at Coorow in Western Australia. 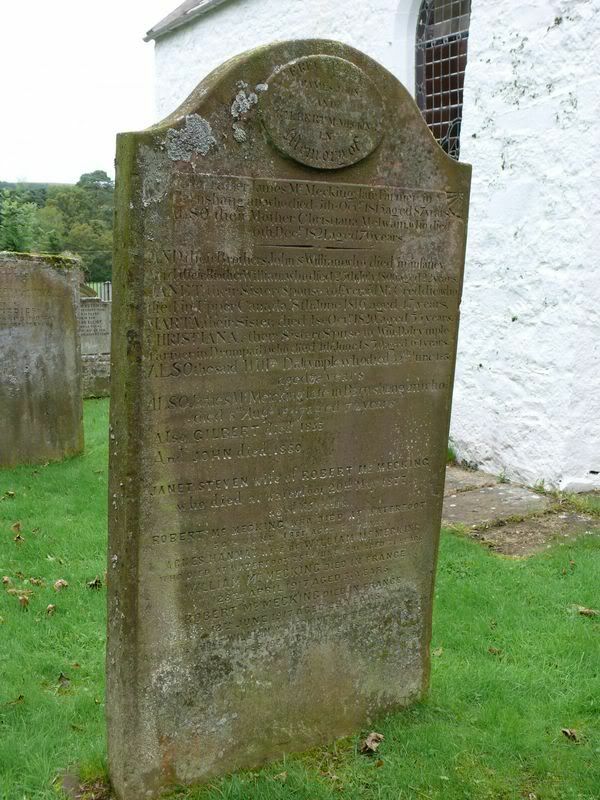 One of them, Thomas McGill, is named on the Mochrum WM in Port William. Thomas McGill – age 27 – Private (6544) 16th Battalion, Australian Infantry. The entire McGill family emigrated from Chanque Farm, Mochrum in June 1910 and worked a farm at Coorow, north of Perth, in Western Australia. Thomas and his brother, John Bell McGill, enlisted in March 1916 and sailed from Freemantle in the October. He arrived in France in February 1917 but was wounded in April 1917 and was invalided to England for treatment for a gunshot wound to his right arm. He rejoined his Battalion on 12 August 1917 but eight days later was fatally wounded and died in the 2nd Australian Casualty Clearing Station. 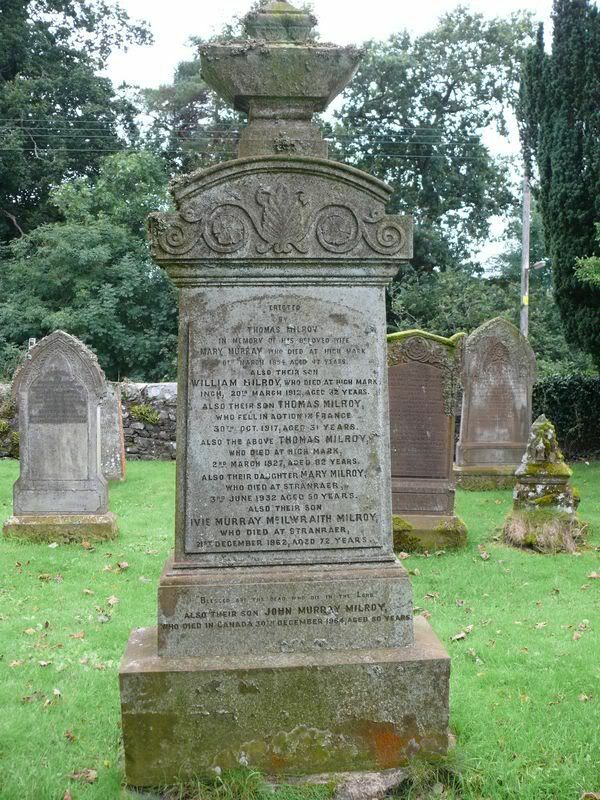 Son of James and Janet (Bell) McGill of Coorow and later of Queen's Park, Perth. 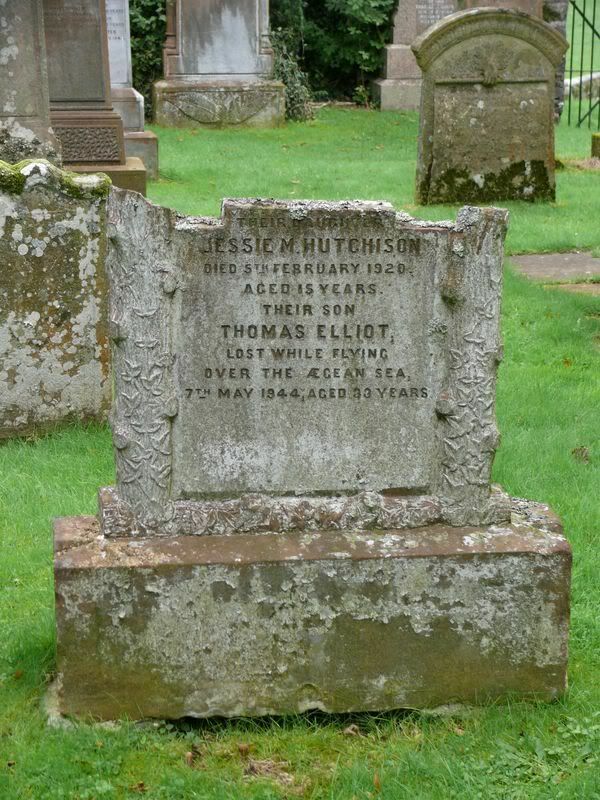 Died of Wounds – 20 August 1917. Commonwealth War Grave – Trois Arbres Cemetery, Steenwerck, France. 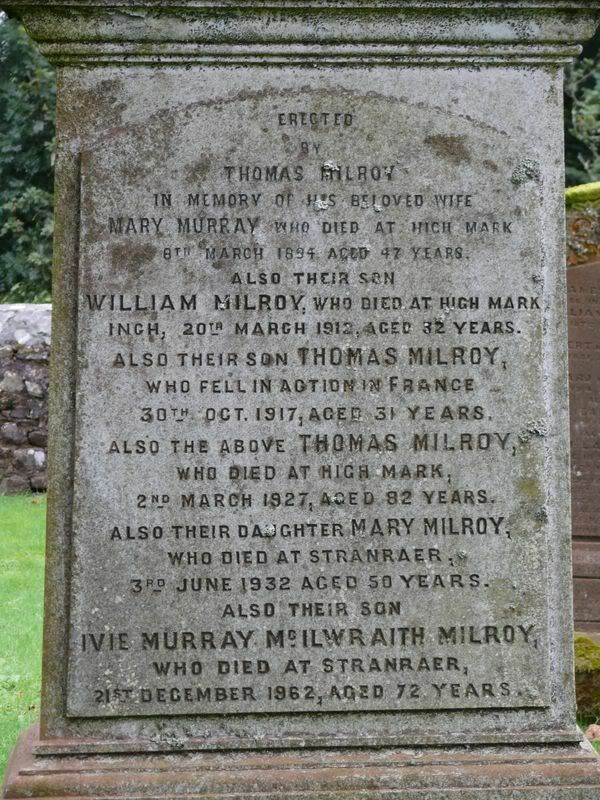 Note: Tom's brother, John Bell McGill, survived the war but died in Whithorn in 1922. 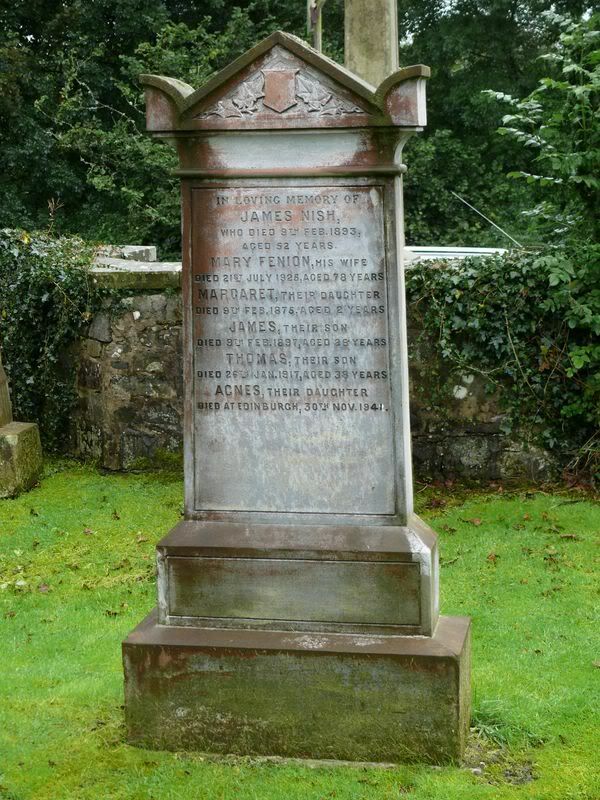 He had married Elizabeth Kevan in Whithorn in 1917 and had returned to Whithorn to bring her and their son to Australia. The brothers' cousin, George Bell, who had worked with them on the farm at Coorow, was killed at Gallipoli on 25 April 1915 serving with the 11th Battalion, Australian Infantry.